The sidewalk in front of 234 North St. in Hingham is crowded with garden sculptures - a mix of stone urns, imperious dogs, and other assorted statuary. The arresting outdoor collection, however, is just a preview of the fascinating mix of treasures within Beyond Gorgeosity. Stepping inside the crowded showroom is like opening the pages of a fantastical storybook. Gilded rococo mirrors hang next to the clean, spare lines of a 1950s bar cart; colorful, complicated chandeliers loom over a six-paneled, hand-painted screen. "I'm a little schizophrenic about my collection," owner Peter J. Levis said with a smile, "but that's what keeps it interesting." For Levis, who opened Beyond Gorgeosity just a year ago, keeping it interesting has been the priority. The Dorchester native had no formal training in interior design, but as his colleague, Boston-based interior designer Michael Valvo, said, "he's got a great eye, and that's something you can't teach." Levis said his appreciation for art and design is in his genes. "My grandfather was a Boston society portraitist who turned to stone and marble importing to support his family," he said. "I grew up in an 18-room house in Dorchester that was decorated like the `Addams Family's' home," he said, snapping his fingers like the theme from the '60s TV show. But Levis never thought about working with antiques. For nearly 20 years, he worked for insurance giant AIG as an underwriter in London and Barcelona. "I lived well enough in London to hire interior designers," he said, "so I learned how to approach a project and how to listen to clients." Levis says he burned out on the insurance industry and left the company just months before the meltdown last year. "I had no idea about the state of the company," he said, "but I was having my midlife crisis and I inherited my father's condominium and figured it was time for a change." While he got out of AIG just in time, last year was a challenging time to start a business. "It's actually been good for me," Levis said. "I have the retail business, interior design work, and I'm handling a lot of estate sales and getting to know dealers and potential clients. People may not be ready to spend money to completely reimagine their home, but they love finding the quirky pieces I have available." As Levis shows a visitor some of his favorite pieces in the showroom, it's clear he made use of his time to research the makers of the assorted furnishings he has gathered. "Gio Ponti is to Italian 20th-century design as George Washington is to the success of the American Revolution," he said without the slightest sense of irony. Levis proudly shows off the piece he calls his most prized possession -an Ico Parisi vanity from the '50s, with delicate, insect-like legs that still evoke a sense of sturdiness and elegance. "Evelyn Waugh called `Brideshead Revisited' his magnum opus," he said. "This vanity is my magnum opus." As he builds his client base and his access to dealers, Levis is reaching out to other designers like Valvo. "My studio, Red M, is based in the North End of Boston while Peter is in the suburbs," Valvo said, "and I think there are lots of opportunities for sharing expertise and partnering on some projects. Ultimately, I think Peter is a great resource for designers." Levis says he's happy to be based in Hingham, a town small enough to allow him to get a fair amount of foot traffic, but he admitted he's not the initial draw. "My dog Bonsai opens doors for me," he said of his miniature dachshund. "For the first time in my life, I can imagine what it's like to be a buxom blonde who gets all the attention." Bonsai may be a calling card, but Levis's quirky taste, surprising and enchanting combinations of pieces, and depth of knowledge about his collection have made his storefront a stop some say is worth a visit. 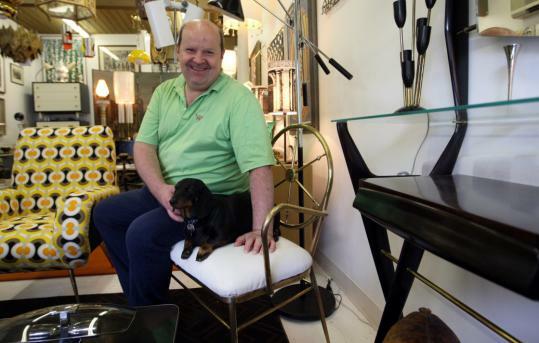 Caption: Designer Peter Levis, with his dog Bonsai, at his Hingham shop Beyond Gorgeosity. Jonathan Wiggs/Globe Staff; Beyond Gorgeosity offers a fascinating mix of items. Jonathan Wiggs/Globe Staff Reproduced with permission of the copyright owner. Further reproduction or distribution is prohibited without permission. Abstract (Document Summary) Gilded rococo mirrors hang next to the clean, spare lines of a 1950s bar cart; colorful, complicated chandeliers loom over a six-paneled, hand-painted screen.